I love the stripe on stripe here working with the dot tie. Again something that could be easily be considered overdone in a store display but actually works very well in real life. Really cool guy, I also like the stripes and dots, very nice outfit! Looks dapper! I love the stripes/stripes/dots combination, a bit eye-popping but that is fine by me! Mr Faust always looking dapper! love the combination. the beautiful blue pops! Yes, there’s alot to take in with the stripes and dots but it works. Somehow it looks better to me in the close-up shot. I like being able to see the detail. I couldn’t normally do that if he was just walking by me on the street!! does he work for Ralph? he looks like he’s wearing Purple Label, handsome too. One for a passport perhaps… I do like extra details like this. The stripe combo is the bomb, but I personally never liked a solid collar on a patterned shirt. Overall he is to be congratulated although the balance, contrary to the comment by Sartor, is actually a bit off. 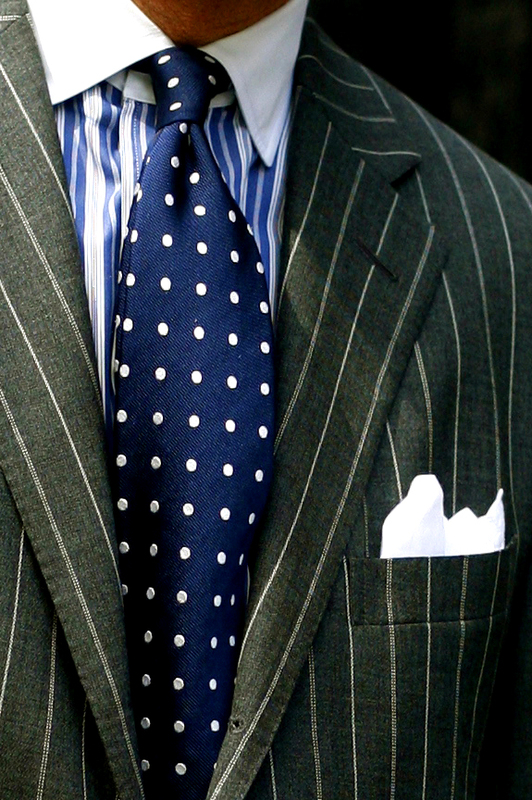 The stripes of his suit and shirt are about the same weight while the polka dot tie is also of roughly of similar weight. He would have done better to have had a solid under the white collar or small stripe on his shirt. Basically teaming stripes takes some thought and requires contrasting gradations of weight to work well. Flusser has some good guides in his various books. The Duke of Windsor was the expert, look at some of his photos. Between this post and the Dior Homme post below, your blog is the reason that I don’t bother buying fashion magazines anymore (sorry Vogue). You give a mean fit clinic. Many thanks. I disagree – it’s very well and widely scaled. His shirt has a complex stripe with a definite difference in emphasis from the widely spaced pin stripe of the suit; the polka dot of the tie is the most emphatic element. And while the Duke of Windsor is a good place to look as an example, he made his name by breaking the rules, and was often ridiculed in the press for his strange (for the time) clothes. Aside from the posture, as someone already suggested, this looks like it could be a Ralph Lauren ad. Could someone please explain how a suit is supposed to fit? I find the area around his waist where it appears to pull make it look a bit too snug. Is this how it’s supposed to look? oh i don’t know. many rule-breakings are ok but this one feels uncomfortable, like a mango strand stuck in between the teeth! It’s so nice to see a man so well dressed. To weigh in on the white-collar debate, I’ve never been a fan of them, but neither an all-white nor all-striped shirt would have worked as well here. He’s doing for the white collar shirt what others on your blog have done for white shoes…make them acceptable…uh, in the abstract. love love love your blog by the way. keep up the eccentric finds! Whenever I check this blog ( which I do religiously) my heart always sinks a little whenever I see a suit-and-tie variation AGAIN. I’m all for funky menswear that can be inspiring for both sexes or the occasional sharply tailored suit, but if you could focus a little less on basic suit-and-tie ensembles or do a separate section for menswear, that would be great! You have a very keen eye for chic women’s outfits that I feel like I haven’t been seeing enough of in recent posts. Agree with Alice – love the look of this in the closeup, but not so sure I’d notice that if he walked past me on the street. As usual, you have a phenomenal eye. re: the pulling…. It’s hard to say if it’s a sizing issue. Sometimes a little pull can be a good thing – adding an element of definition to the jacket. But, as suggested by another poster, it can also make the garment appear too small – we really have no way of knowing without seeing the back of the garment. That being said, I’d wager to say it’s an acceptable size, just a less than ideal button stance. 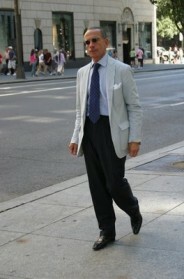 This is Philip Faust who heads up Ralph Lauren Blue Label Clothing. I think you’re right. I too suspect that this gentleman works for RL. Let’s play fashion sleuth, shall we? Well.. and then there’s the fact that I passed Mr Schumann on 5th Ave,just around the corner from the above mentioned black window the day before this post, so I have to conclude that I have pinned the location. Lastly,whenever one sees a handsome fellow with a perfectly fitted chalkstriped suit…accessorized within an inch of his life, in the general vicinity of Madison and 58th/59th St one certainly raises an eyebrow with regards to the possibility they’re on the RL payroll. I could very well be mistaken but then again I’m rarely wrong on matters of such importance. I think that if the tie were solid. I may not have concluded my findings as such. I do think that perhaps this fellow has struck one note to many. ..Rafe,let’s talk after work about that drink. I consider this blue-on-blue stripes/dots shirt and tie combination smart, but quite conservative, although many men who dress conservatively seem never to think beyond solid shirts and small-patterned ties (excepting perhaps the always impeccable Charlie Rose). I will, however, quibble about the fit of this coat. It looks a smidgen too tight to me. The gentlemen has correctly buttoned only the second button of the three-button coat for walking, but the button pulls just a bit, making those diagonal wrinkles around the closure. And then there’s the ever-so-slight curve of a belly roll visible beneath the closed button, forcing open the jacket at the waist. However, it does look as if a correction in posture might resolve those apparent fit issues. A classic look and very nicely done. The dots on the tie are a touch heavy for my taste, but it’s all put together so well. I notice that that there have been some comments (on this and other posts) regarding suppression at the waist of men’s jackets. This is something that has arisen out of the tailoring of military tunics. Take a look at prints of English or French cavalrymen of the 19th century in full dress. as i mentioned on the post he is leaning just a bit in the photo which gives a little pull to the jacket and the jacket is not perfectly sitting on his body = look how one sleeve cuff is showing more than the other. i certainly don’t think it makes it any less viable. in that same area are Hickey, Bergdorf, Barneys, Zegna, Vacca, Borrelli – a lot of very well dressed gentlemen but RL employees just always seem to get it done really well. A couple of folks have queried my comment about the weight of patterning. It’s very much in the eye of the beholder of course but these subtleties are a bit like quality, hard to describe but you know it when you see it. On the topic of fit which a lot of people picked up on, his jacket is tugging in places. A tight fit is popular in places like Britain and Italy, take a look at some of Sartor’s pics, but it only really works on the very young with concave stomachs. For the rest of us, I personally think nothing looks worse than clothes that are too tight. They are also damned uncomfortable. Take a look at a lot of books on the subject of mens clothes which spend a lot of time on sartorial methods for dealing with American calory intake. Tight clothes are a contradiction of these efforts. Well cut clothes that fit don’t tug. It’s as simple as that. Re: The anonymous comment above that asks to see less posts about suits. I don’t want less of anything, I want MORE of everything, suits included! This is a great combination of patterns/colours. The white pocket handkerchief is particularly interesting. Would be interested to see more of this subject. Schedule lunch immediately, sir! Anyhow who would dress so carefully yet so casually is a friend of mine. You are to be admired and emulated….by men and perhaps even by women. It can not be a Ralph Lauren suit (purple label). If you look closely at the the lapels, the one from RL is peaked, as this one is indeed notch. Subtle differences.